Illuminated Reticle with Brightness Adj. The Vulcan 6x Gen F.L.A.G. 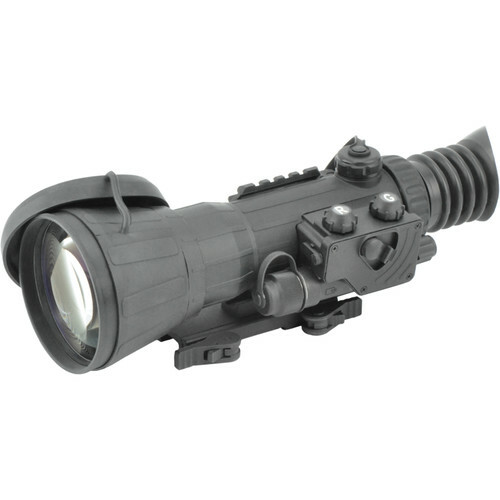 MG Night Vision Riflescope from Armasight features an NVD scope capable of 64-72 lp/mm resolution and manual gain control. The Armasight F.L.A.G. features a filmless, autogated gallium arsenide photocathode; it also features Automatic Brightness Control, which continuously adjusts image brightness to optimize the displayed image quality, and a variable brightness adjustment for the illuminated red duplex crosshair reticle. The Vulcan 6x Gen F.L.A.G. also features a bright-light cutoff and LED battery power indicators displayed in the screen of the eyepeice. This night vision riflescope is fitted with a double lever-lock quick release mount compatible with Weaver and Picatinny rail systems. A 145mm f/1.8 lens system displays a 7° field of view, making the Vulcan 6x Gen F.L.A.G. scope ideal for many viewing tasks. Combined with a removable IR illuminator and waterproof rubberized housing, this riflescope is well-equipped for observations - low light or no light, indoor or outdoor. Box Dimensions (LxWxH) 16.0 x 5.0 x 5.0"